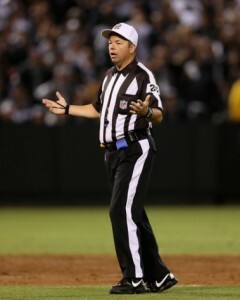 The NFL replacement referees didn't lose the game last night: M.D. Jennings did. 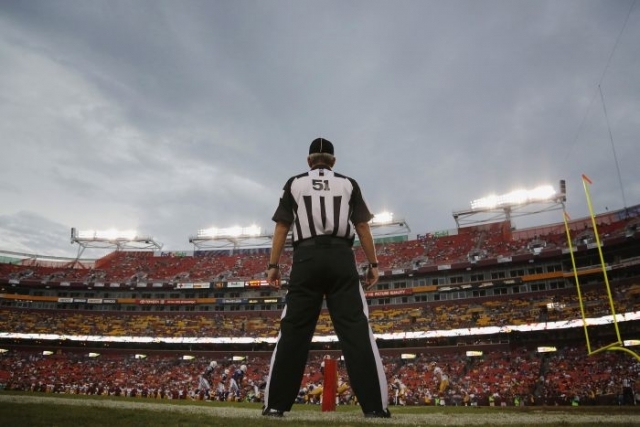 Is there a more vilified role currently in modern society than the NFL replacement referees? 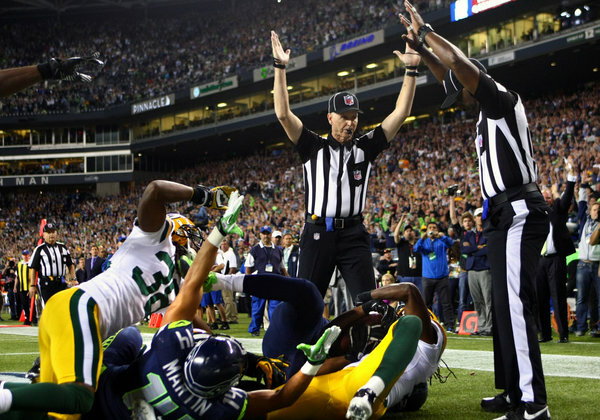 Green Bay and New England NFL fans hate the replacement referees. Reggie Bush hates them, Drew Brees hates them. Paul Ryan hates the replacement referees. Your Grandmother probably hates the replacement referees. NFL referee costumes are going to take on a whole new meaning this Halloween. Perhaps it is time to take a short step backwards though and at least ask a few questions about this furor, before we go tar and feathering anyone. First, that big play last night. In case you missed it, Golden Tate of the Seahawks, challenged Green Bay defensive back M. D. Jennings for the ball on the final, hail Mary type heave into the end-zone. Both players appeared to have a grip on the ball and the referees invoked the NFL rule that basically a ‘tie’ like that goes to the offensive player. You can argue the finer details until the cows come home, however, I would contend that Jennings caused much of this issue by not playing his position properly. Any good defensive back will tell you that the correct play in that situation is not to try and catch the ball, but to slap, slam, slice the ball to the ground. Knock it down, deflect it, spike it, whatever. Just don’t try to catch it. Try to catch it in traffic like that, and complications arise, such as last night. If Jennings did his job, if he had slapped the ball away instead of trying to catch it, we probably wouldn’t even be talking about this today. The game would have ended, and the Packers would have gone home, presumably, happy. Instead, everyone is jumping gleefully on the ‘slam the replacement refs’ bandwagon. Reggie Bush, that great intellect, posted on Twitter that the “refs single-handedly blew this one.” Well, actually Reggie, no, the refs made a judgement call on a poor play by Jennings, in my view. Jennings put them in that situation. Drew Brees, the New Orleans quarterback, wrote that “this is NOT the league we’re supposed to represent.” Love the capitalization, Drew, now, does this mean you will no longer be eulogizing about the bans handed down on Saints players who were proven to be trying to injure other players, or will you be keeping that up too? My personal favorite has to be Republican Vice Presidential hopeful Paul Ryan, who has slithered onto this subject with all the class of a greasy snake. Ryan is trying his best to link the replacement refs with Obama, 9/11 and the Loch Ness Monster. In interviews the last 24 hours he is claiming to be a Packers fan, warbling; "My blood is green and gold." Considering he is flip-flopping like a dead fish on most issues I guess we shouldn’t be shocked he was waving a Pittsburgh Steelers' "Terrible Towel" during a Pennsylvania campaign event in August. Classic Ryan. I think we all need to calm down a little. I am not comfortable with the labeling of the NFL replacement referees as ‘scabs’. They are just a bunch of dudes who are trying to make a temporary living off of refereeing football games. Your beef should not be with them. Unless of course you think there should be no NFL games until the real referees return. Let’s all tone it down a notch, shall we? M.D. Jennings made a fundamentally poor defensive play last night, and should bear the brunt of the Green Bay frustrations. The referees who are working the game right now are doing their best. The simple fact is that without them there would be no NFL right now. Have a think about that for a second. Is that what you want?